Matt Smith and I ventured up to Aston University, Birmingham on the 9th May to take part in the new Digital Capability Community of Practice, launched by Jisc. As frequent visitors to the blog will know, the CEI have awarded Matt an Education Innovation Fund grant to look at developing staff digital capabilities at Cardiff, with the project focussing on the School of Pharmacy in particular. This initial community of practice meeting was very much focussed on starting the conversation, sharing, discussing and comparing ideas and approaches. As we are an institution currently discussing its approach to “digital”, it was certainly a timely experience for Matt and myself to gather opinions from other institutions, and learn about their journeys and strategies. The new “Developing organisational approaches to digital capability” online guide had been launched by Jisc the previous week, and was introduced by Sarah Knight, along with further community resources such as the “guide to developing organisational approaches to digital capability” and audit and checklist tools. Matt and I have been particularly interested in “Role Profiles” developed by Jisc (of which we are personally over the moon to find Learning Technologist profile! ), which align to the digital capabilities framework, UKPSF and highlight the capabilities associated to the particular roles. The roles include HE teacher; Library and information professional; Learning technologist; Leader; Researcher; Learner. We are also interested in the Jisc discovery tool (beta), which enables staff to identify and reflect on their current digital capability, as well as offer a playlist of relevant resources to improve their capability. We currently have access to this beta tool as an institution, and staff are more than welcome to trial it and offer their feedback. All these resources can be found at Jisc’s Building Digital Capability project page. Helen Beetham gave an overview of the digital capability agenda, how we got to where we are now, and why is it an agenda in education now? She also discussed changes in context, changes in subjects and changes in learner practices, experiences and expectations. Helen also discussed “Who is responsible”, an issue that we Learning Technologists at Cardiff have debated over the years. There were also two speakers presenting case studies from their institutions. John Hill (University of Derby) described the journey of developing an integrated approach to staff and student development, incorporating the Jisc digital capability framework, online discovery tool and role profiles. John also discussed the new TEL strategy at Derby, and it’s strategic goals. Richard Fullylove (Coleg y Cymoedd) discussed the challenges and approaches to the work they undertook; forming key partnerships with stakeholders; the institution providing 30 full hours of CPD provision for staff; digital events – Digifest, Digitalks, Digital Workshops; digital vision and steps to success. A periscope recording was taken of all the presentations and is available to view. The workshops were of great value, a chance to discuss different approaches that have worked, have not worked, and interesting new ideas and views (as well as the historic and obvious problems). They first workshops were themed: Approaches to developing staff; Approaches to developing students; Building organisational capacity; Developing the digital curriculum. 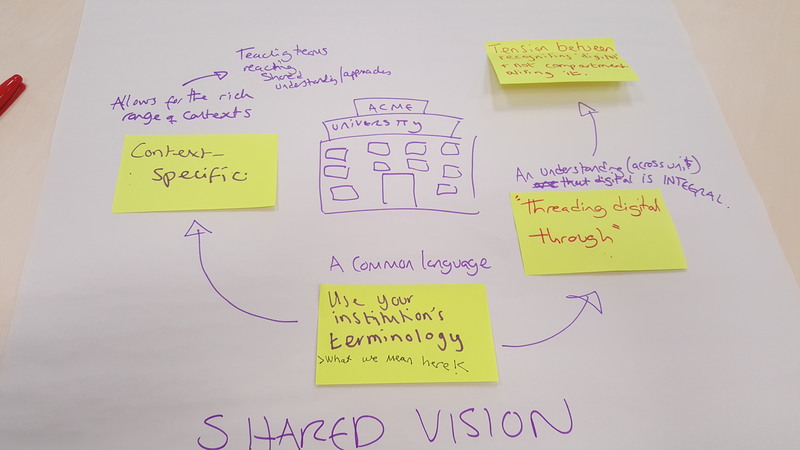 I joined the building organisational capacity group, where we discussed a shared understanding and vision for the institution, and developing a common language – developing meanings for terms that institutions feel comfortable with, with terminology that staff and students understand. Other discussions within our workshop included cultural readiness; issues with skills and HR divisions; what works well? The afternoon workshops focussed on three issues: barriers to digital capability development; drivers to digital capability development; available resources. It was interesting to hear about the drivers and barriers for different institutions, as well as learning about the types of resources that institutions have used. A list of all the barriers drivers and resources are available. What one thing should the community do? Which activities would you prioritise for the community? To join the community, please visit http://www.jiscmail.ac.uk/jisc-digcap-ug. On Twitter, follow #digitalcapability. Thanks to Sarah Knight and Jisc team for organising the community and the meeting, and to Helen Beetham for jogging my memory with her excellent blog post. On a local level, the Digicap project continues within the School of Pharmacy, and as I mentioned, staff are free to trial the new Jisc Discovery tool. If staff or Schools wish to talk about any of the issues raised within this post, please contact ceilt@cardiff.ac.uk.